October 1, 2018 "Instructions For Irs Form 1120-w - Estimated Tax For Corporations" contain the updated filing procedures for the IRS-issued Form 1120-w. Download your copy of the instructions by clicking the link below. IRS Form 1120-w is a tax form issued by the United States Internal Revenue Service. they were published, go to IRS.gov/Form1120W. 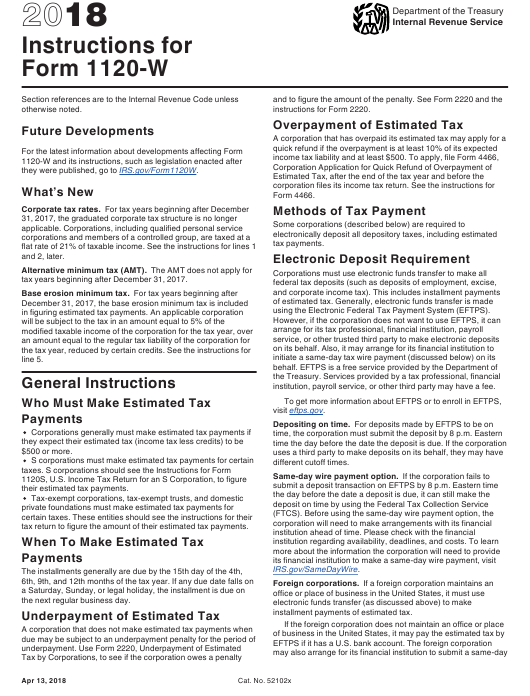 tax years beginning after December 31, 2017.
using the Electronic Federal Tax Payment System (EFTPS). institution, payroll service, or other third party may have a fee. tax return to figure the amount of their estimated tax payments. the next regular business day. installment payments of estimated tax. 1120. Large corporations, see the instructions for line 11 below. line 9a and enter the amount from line 8 on line 9b. P.O. Box 409101, Ogden, UT 84409.
enter the next business day. corporation may owe a penalty. 9th, and 12th months of your tax year in columns (a) through (d). estimate, failure to make a deposit, or a mistake. the order in which the installments are required to be paid. "large corporation," see the instructions below. maximum rate that is in effect for their applicable tax year. 21%. Enter this amount on line 2.
figuring one or more of its required installments. To use one or both of these methods, complete Schedule A.
schedule of other income tax returns. figure the amounts to enter on Schedule A, Part III, line 35. (a) through (d) of line 11.
in column (b). Enter 25% of line 8 in columns (c) and (d). payment date, it must be used for all payment dates. of the month preceding the due date for that installment. steps used to figure the tax on Form 1120-W, page 1, line 2.
months shown in the column headings above line 1.
taken into account in determining taxable income. annualizing the taxable income for the annualization period. periods 2, 4, 7, and 10, in columns (a) through (d), respectively. of their respective tax years. (controlled foreign corporation income), special rules apply. income or deduction used to figure the credit. completing line 33 in column (b). include on line 23b. See Extraordinary items, earlier. line 38. Also enter the result on page 1, Part I, line 11. Enter the annualization amounts for the option used on line 20.
shown in the instructions for their business income tax return. the amounts for the months shown on line 20.